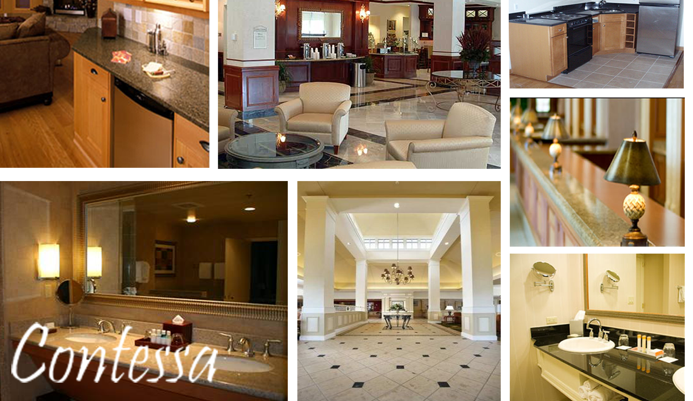 Thank you for visiting our website and your interest in Contessa Surfaces. We are a supply service offering natural stone, cultured marble, solid surface and quartz products to commercial enterprises throughout the United States. We also supply high quality cabinetry manufactured by KraftMaid. Hotels and multifamily development customers demand high quality products and efficient service to meet their construction timeframes whether it involves a new development or renovating existing properties. Contessa has a proven track record to meet customer needs. We are licensed and bonded and we have extensive experience working with customers to develop exact work submittals for each project. We work closely with our fabrication teams, whether domestic or imported, to produce high quality products. We are dedicated to clear and timely communication of lead times, ship dates and delivery timeframes to ensure our customers that their product will be completed when promised. •We have our own domestic fabricating facility in Salt Lake City. •We can re-fabricate and deliver broken pieces within a week after being notified by the customer of needed replacement material. •Our employees in China continually monitor fabrication quality and shipment timeframes for imported orders. •We employ in-house designers to work directly with our customers to ensure accurate measurements and quantities for each project. •We have several supply sources to provide a wide range of products at the most competitive pricing. •We can provide references from a wide spectrum of customers demonstrating our ability to deliver on projects of all types and size. •We are bonded and insured. • We have several years experience dealing with all types of issues enabling us to become a best practice company able to meet your needs. We are easy to work with. While we have the strength and resources of a National Company, we think of ourselves as a neighborhood business catering to the construction community.